It is with sadness we note the death one of our Australian Olympic Goal Keepers in Noel McLoughlin after a long journey with illness in his later years. Noel was a pioneer of Ice Hockey in Victoria, nicknamed “Bluey” or “Redda”, he started post war in 1946 with the Northern Suburbs team. In 1947 he was an inaugural member of the Red Arrows IHC playing there until the end of 1952, moving to the Demons IHC Inc in 1953 until his retirement in 1964 being a major part of their history for that time alongside his great friend and Olympic teammate Russell Jones (deceased). Noel’s career of 230 games places him at 10th for most IHV games as a Goal Keeper post war. 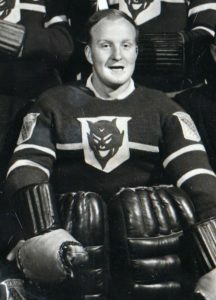 With limited stats available from the 1950’s, Noel is recorded as playing 185 games, took 4762 shots allowing 582 goals with a Career Saves% of 0.877. He achieved 15 Career shut-outs with the Demons and 50 wins as their Goal Keeper. 1960 Squaw Valley USA Winter Olympics. Noel returned to hockey in the early days of the Nite Owls through the late 1970’s and 80’s The Reid/McLoughlin Trophy is awarded annually for the Best Goal Keeper in the IHV Senior B competition. 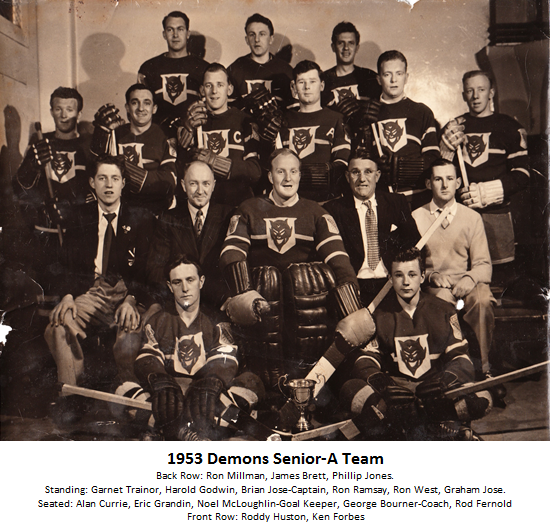 The Noel McLoughlin Perpetual “Most Outstanding Goaltender” trophy is also awarded annually by the Demons IHC. Noel was honoured with Demons IHC Life Membership in 1964, honoured with IHV Life Membership in 2000 and was elevated to “Legend Status” of the Demons IHC in 2009. Noel was a wonderful gentleman who will be sadly missed by all those who had the fortune to have been in his presence! The Demons IHC would like to pass along their sincere condolences to his family and friends.